It's a fact that I am a sucker for pretty covers, so of course The Belles sucked me right in the second I saw it! It's easily one of the most gorgeous books of the year! Add to that a synopsis that's equally as eye catching, plus a powerful female MC, and I hoped I'd have a new favorite on my hands! I was SO excited to get an advance copy of this book, although I'll admit I was intimidated by the size. Still, I dove in as soon as I was able and am happy to report that I did enjoy it, even if it was a bit bigger than it really needed to be. Camellia is a Belle, a controller of beauty who helps the people of Orleans become who they want to be (as long as they can afford it). The story begins as she's competing for the position of favorite Belle, the one chosen to live in the palace and work for the royal family and court. At first, she doesn't get everything she wants, but it's only a matter of time before her wish comes true and she's positioned in the royal palace just like her mother before her. Camellia was definitely a strong, powerful woman, although I didn't end up loving her quite as much as I thought I would. She is very good at what she does, but she's also selfish and needlessly indecisive. I do wish more had been explained about why Camellia was so much more powerful than her sisters. Instead, the only thing that we're really told is that she likes to disobey rules and experiment. In nearly 500 pages, I feel like more of Camellia's backstory and more of an explanation about her powers could've been provided. In the beginning of the book Camellia is with her sister Belles, but they are quickly split up. Although we're told a lot about what a close relationship they all have, not much of that is seen and the majority of interaction between them is negative. I'd hoped to get more of a glimpse into the bond they shared. I did enjoy Camellia's relationships with both Bree and Ivy and found them to be one of the best parts of the book! There was also a hint at a romance or two, but it was not central to the story. It seemed at first that there might be a love triangle brewing, but that didn't really happen, thankfully. I did love Camellia's relationship with Remy, her personal guard. As I've already hinted at, I do wish there had been more explanation for the Belles themselves and how their powers worked, as well as the society of Orleans and how it functioned. All we really ever saw was the palace and its immediate surroundings and the only things that ever seemed to happen in the world had to do with Belles and beauty. I understand that the author was making a point, but this world most definitely needs to be fleshed out a bit more (which sounds crazy since I'm talking about a nearly 500 page book). There were endless descriptions about people's hair and dresses and the Belle's appointments and goings on. I do wish that most some of this had been left out in favor of more world building. As the story was told, however, it could've easily lost 150 pages and still gotten all the same points across. It was needlessly bloated with descriptions that dragged down the pace for no real reason. None of this is to say that I didn't enjoy this book, because I did! The concept of The Belles is incredibly unique and, although the story was dragged down in places by too many descriptions, I kept turning the pages because I wanted to know what would happen next and where Camellia would end up. The villain was certainly scary and added a sense of urgency to Camellia's actions, and there was a twist that completely took my breath away! 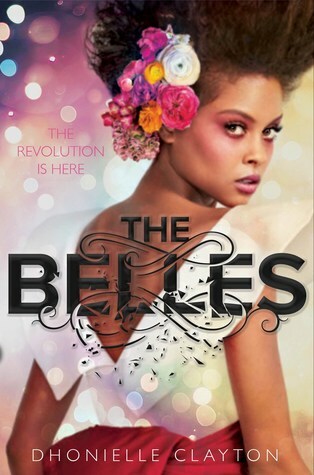 A word of warning, The Belles does end on a massive cliffhanger. I actually (somehow) didn't realize that this was a series and as the book was coming to an end I was trying to figure out how it could possibly wrap up. It didn't. I hate all cliffhangers, but this one was extremely abrupt and left way too many questions. I guess it did its job though, because I'll definitely be reading the next book to see what happens next. The Belles definitely had its issues. It was overly long and in dire need of more world building. But it was also incredibly enjoyable with an intriguing concept and its definitely a story that I plan to jump back into when book two comes out a year from now! I'm looking forward to seeing how Camellia copes and honestly I'm just so excited for the romance that I know is inevitable in book two.